hen Connor McVey and his partner arrived at the trailer, a gruesome scene awaited. The sheriff’s deputies were responding to a call about a domestic violence incident in which a husband and wife nearly died in a murder-suicide stabbing. After a quick survey of the situation, they jumped into action to subdue the husband and wrestle the knife away. Then they got to work providing first aid on the couple until the paramedics arrived. Both victims survived, and for McVey, that dispatch call changed the course of his career. After spending three years as a deputy sheriff in his hometown of LaBelle, Florida, McVey — who holds a master’s degree in criminal justice — turned in his badge and set his sights on becoming a physician assistant. "The most important skill I learned from my law enforcement training is the ability to stay calm and collected in stressful situation." 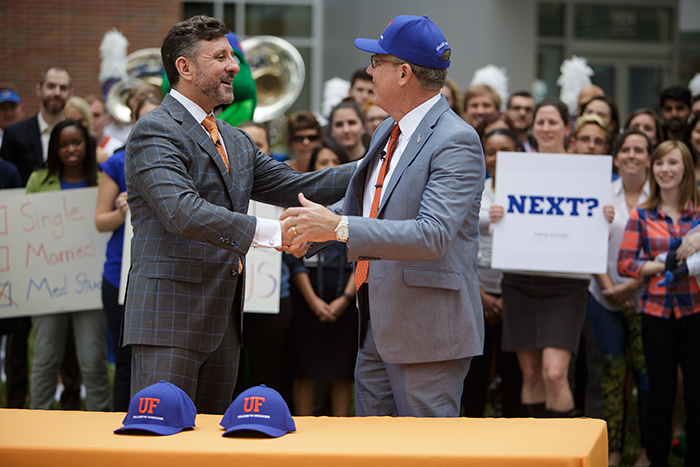 As a new graduate of the UF School of PA Studies, McVey plans to dedicate himself to treating those with mental illnesses through a career in psychiatry. He says his law enforcement background will come in handy as he enters the health care arena. As a communications specialist for the advancement communications team, she oversees the UF College of Medicine’s social media accounts, manages several several of the college’s websites and contributes to various publications. Before joining the UF Health staff in 2013, she worked at the UF Foundation communications office, where she wrote for the university’s alumni publications and website and managed a regional pilot microsite. She also contributes to multiple magazines as a freelance writer and copy editor. She holds a bachelor’s degree in journalism from UF. A local family of UF alumni support pediatric cancer research at UF Health through their non-profit foundation.